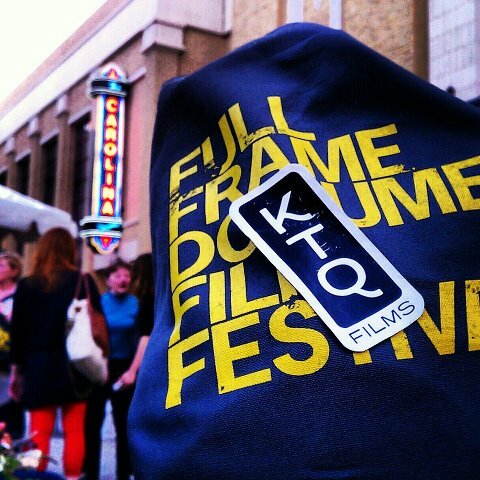 The Full Frame Documentary Film Festival just celebrated its 15th anniversary last weekend. We're big fans of the festival so we sent Ian Kibbe to visit and report back. Full Frame has screened a number of our films: The Interrupters (Jury Award Winner) and A Good Man in 2011, No Crossover and Taylor Chain I & II in 2010, Milking the Rhino in 2009 (when Steve James also curated a series on sports docs), At the Death House Door in 2008 (Inspiration Award Winner), and Stevie back in 2003. We were sad to not have had a film ready for screening this year, but Ian's report makes as feel as if we were there! As a North Carolina native, I have to say I’m a bit embarrassed that this was the first time I’d been to Full Frame. I grew up with it, and can remember when it was called “Double Take” back in 98’, but until this year I’d never actually been. I’d heard from family, friends and fellow filmmakers what a great festival it was, how I really should take advantage of it being in my hometown, but for whatever reason, I’d never made the trip happen. What can I say? I’m an idiot. So, this year, when I found out I’d be able to go as a representative of Kartemquin, I packed my bags and left my idiot ways behind. Anyway, here are some of my thoughts on the films and the festival from the weekend. None of the 12 films I saw ended up winning awards, but every film I saw, I really enjoyed. That says something about the quality of programming. Sadie Tillery and her crew should be commended for their programming work. Not only were the films good, they looked amazing. I heard some filmmakers thought that their films had never looked better. Congrats to Director of Production, Ted Mott and Quince Imaging. Unfinished Spaces: A beautiful and at times heartbreaking look at the Cuban National School of Arts. Created shortly after the Revolution, these beautiful, architecturally unique schools were left to decay as Soviet architectural and cultural influences take greater hold in Cuba. Being partially Cuban, this film really struck a chord with me. You see how what might have been a unique and Caribbean revolution is transformed into something darker as Cuba’s relationship with the Soviet Union grows. Goodbye arts, hello prefabrication. I attended a packed early morning panel titled, “The Shifting Sands of Programming.” A few takeaways: A) Things are changing very fast and as filmmakers we need to be very aware and receptive to those changes in order ensure our films get seen. Not even the execs from The Doc Channel, Weinstein, A&E, or POV know what the future of programming will look like. B) There is no formula for success or guaranteed path to acquisition. C) James Ackerman says The Documentary Channel regularly combs Kickstarter for films. Also, Full Frame Executive Director, Deirdre Haj called me out as the “Young turk from Kartemquin” which got a few laughs. Speaking of Deirdre, she also deserves a ton of praise, as her staff and the corp of volunteers did a great job hosting the event. Things went off without a hitch. Reportero: Talk about bravery! This story follows the increasingly dangerous work being done by the journalists of the Mexican newspaper Zeta, as they investigate drug lords and corrupte officials in Mexico. Whenever I feel like complaining about the difficulties of my work, I’m going to remember this film. Attended a great meeting of southern media folks at the Southern Documentary Fund Full Frame party. Long live the Southern filmmaker. The Imposter: When I hear “dramatic reenactment” my first response is typically to make a face that conveys my apprehension about dramatic reenactments. The Imposter however, really pulls it off. I was on the edge of my seat through this whole doc. From now on I may be hiring people to reenact my apprehensive face. Durham! It wasn’t long ago that downtown Durham wasn’t exactly the place you went to hang out. The crime rate was high, and there just wasn’t a whole lot going on. Well, in the past ten years Durham has really turned around. There are tons of great local shops, restaurants, food trucks, breweries, etc. It has become a generally “cool” place to be and I think Full Frame and Durham’s commitment to one another has definitely had something to do with it. Under African Skies: I ended the weekend with this celebratory doc about Paul Simon’s album Graceland. I danced out of the theater into the beautiful NC sunshine singing about the boy in a bubble with the baboon...something...you get the point. It was the perfect end to a wonderful weekend. Ian Kibbe is a former Kartemquin intern (fall '09), who worked as Outreach Coordinator for Typeface, and is now shooting and helping produce Dinesh Sabu's Unbroken Glass for Kartemquin. His website is www.iankibbe.com.